NASA's Hubble telescope peered into a distant galaxy and captures 'fireworks' images of star just after the big bang. According to NASA,the new approach allowed Hubble to capture 10 timessharper than it is typically able,revealing the galaxy appears as it appeared 11 billion years ago-just 2.7 billion years after the Big Bang. A natural magnifying glass has sharpened images captured by Hubble Space Telescope.The resulting images reveal star -forming knots of newborn stars only 200 to 300 light years acroos,in a galaxy that formed only 2.7 billions years after the Big Bang. 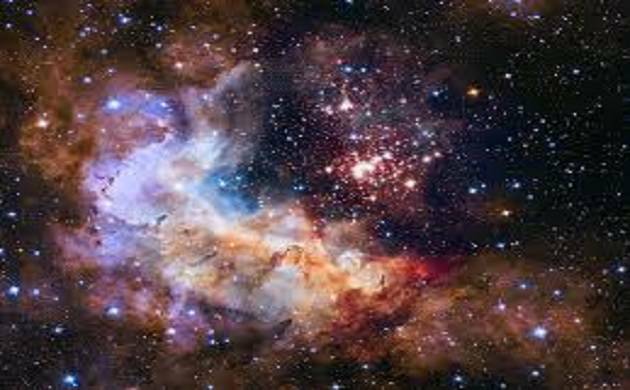 Previous theories said that star-forming regions in the early universe were much larger atleast 3,000 light year across. By enhancing Hubble's capabilities,astronomers detected an edge -on disk galaxy dotted with clumps of newbornstars. Astronomer Jane Rigby of NASA said that 'When we saw the reconstructed image we said,"Wow,it look like fireworks are going off everywhere,". Whereas Hubble revealed newborn stars,NASA'S upcoming James Webb Space Telescope will reveal older,redder stars.This is scheduled to launch in october 2018,with the Webb Telescope ,it can be reveal that what happened in this galaxy in the past,and what we missed with because of dust.